Our second interview in this series looks at the Haitian Creole language (Kreyòl Ayisyen), which is spoken by more than 10 million people around the world. Most, of course, live in Haiti, but there are also substantial speaker communities in the Dominican Republic, Canada and the US (in New York and South Florida especially), and in several other countries as well. Haitian Creole is something of an exceptional case on the Indigenous Tweets web site, as it does not fit any known definition of “indigenous”, having its roots in the colonial language of French going back to the 18th century. Nevertheless, the language fits well with our mission, as it is facing many of the same obstacles as indigenous and minority languages in other parts of the world, competing as it does with standard French as the language of education, literature, and computing in Haiti. It does have some legal status, being an official language of Haiti since 1987, and being taught in primary and secondary schools in the country. For almost two years I have been working with the company Logipam [fr] in Haiti, helping to develop and promote open source software and resources for Haitian Creole. The massive earthquake that devastated the country on January 12, 2010 disrupted this work for time, but over the last year Logipam has returned to work with renewed energy and dedication. 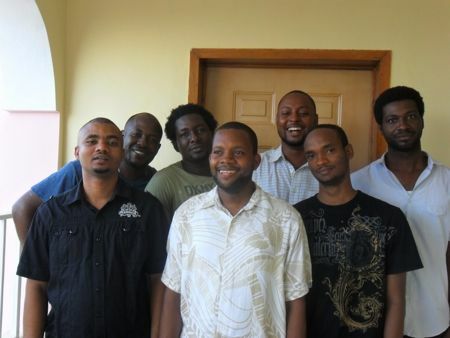 Below is a picture of the Logipam team; from left to right, Jean Came Poulard (@jcpoulard), Monstapha Hilaire (@pwal2k_rot), Eder Hilaire (@kannkale), Metuschael Prosper, Erick Toussaint (@rickytweetht), Emile Poulard (@pouledge), and Jean Baptiste Marc (@metminwi). Jean Came Poulard is an IT Manager at HELP and the Developer Manager of Logipam; he spoke with me about the current state of Haitian Creole and his work with Logipam. Team Logipam. Photo via Indigenous Tweets. Kevin P Scannell: What opportunities are there to use Haitian Creole online? Is internet connectivity or access to computers an issue for your community? What kinds of software and web sites are there in the language? Jean Came Poulard: As Haitian Creole is spoken by all the citizen of Haiti, Haitian Creole websites and social media in this language can be considered as an element of inclusion for the population. This inclusion will create a new era in some domains such as E-Learning, E-commerce, etc. Internet connectivity remains a serious issue in Haiti — it is poor and very expensive (US $60 per month for 256 Kb/s). One hour of connectivity in a CyberCafe costs one US dollar. The majority of social media users post messages from their phones as smart phones become more and more popular, costing US $25 a month for smart phones. 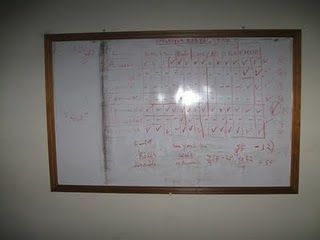 In late September 2009, the Logipam team started work on an open source Haitian Creole Spell Checker, with your help. One month later, we had released the first version of the spell checker (named “Korektè òtograf kreyòl (KòK)“), compatible with Firefox, Thunderbird and OpenOffice/LibreOffice. Now the Logipam team is localizing Firefox using Narro and 36% of the work is already done. Organizing editing work for the KòK spell checker. Photo via Indigenous Tweets. KPS: I mentioned above that many indigenous languages lack computing terminology. Is this an issue for your language? How is/was terminology developed? Is there a “language board” or are terms developed naturally by the community? If there are official terms, how are they communicated to the community? KPS: Are there other special challenges your community faces in terms of developing technology for the language and/or communicating online? For example – differences in dialects, different spelling systems, problem with fonts, lack of computing expertise in the community, lack of interest from software vendors like Microsoft/Apple/Google.